I'm trying to allow anonymous people to send me messages. However, when people try to send me something they need to fill a CAPTCHA, which messes up the ask box layout and renders them unable to post. I haven't found any details by googling, and when I try to edit the theme’s source code I can't get to the ask page HTML. Any details on how to get this done or maybe disable the CAPTCHA? I had the same issue after setting the SSL toggle on (it's in "edit appearance"). Turning off SSL fixed the issue and the captcha works now. I emailed Tumblr to let them know, hopefully it's a quick fix. Not the answer you're looking for? 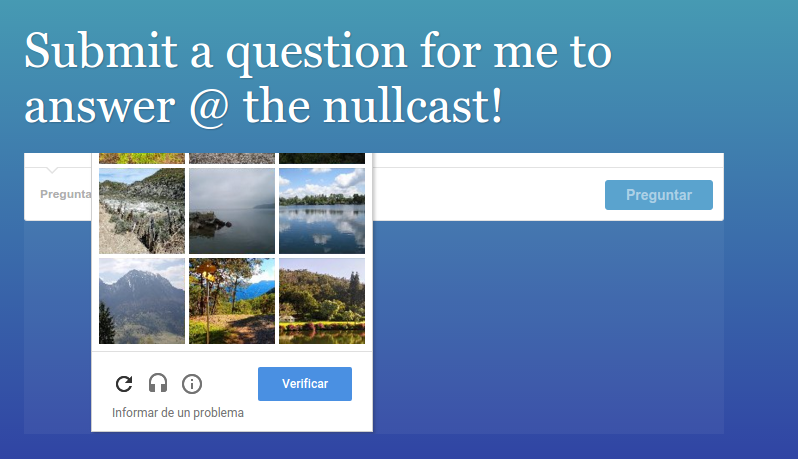 Browse other questions tagged tumblr captcha or ask your own question. Which Tumblr themes displays all tags on landing page? Any way to hide Disqus box from Tumblr ask page only? How to add CAPTCHA on a Cognito Form?